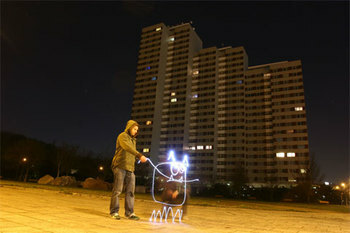 Graffiti artists in Berlin are replacing spray cans with torches, glow sticks and digital cameras. The results are stunning as proved by Flickr user, lichtfaktor. The technique loosely involves setting the cameras to over expose and painting with various lights in the shot. Essentially a form of stop motion animation, light writing employs a phenomenon known as persistence of vision which creates the optical illusion to the viewer. Some companies are even employing the technique to form the part of their visual identity, Joost for example. buttons...this video confirms it with the upmost certainty. Look a bit more closely - this is drawn in dust on a mini. Self-titled 'Dust Artist' Scott Wade has been creating cheeky street art for the past 3 years after "an urge to draw in dust". It is probably the most impermanent art form, representing the nature of all things to return to dust, and then form some art for a while, and then return to dust again.